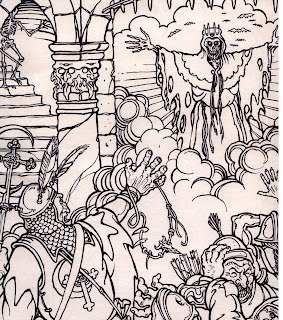 Here's one of many gorgeous illustrations from the The Official Advanced Dungeons & Dragons Coloring Book, published in 1979 by Troubadour Press. One of the great ironies of discourse on the Internet is that, while I'm being lambasted here as an old school fundamentalist for having expressed agreement with Trent Foster's post at K&K, I am informed by others that elsewhere I am being excoriated by an inquisition of busybodies for the crime of having played, enjoyed, and written for games published in the 1990s! Quelle horreur! What a terrible straw man punching bag I am -- possessing human depth, complexity, and even contradictions rather than being a nice, simple automaton of villainy, said "villainy" being things many of my commenters here probably wouldn't believe. James played White Wolf games and liked them?! Impossible. Thank goodness I've hidden these dark truths from the world rather than talking about them openly. Why, if word got out I'd be kicked out of the clubhouse and sent off to the Gamescience dice mines to labor until my skin is flayed by precision-edged d4s! Seriously, guys, I appreciate all the interest in little ol' me and my personality defects, but why focus on such things when there's still tons of really important stuff to quibble about? I mean, we've barely scratched the surface of the Great Armor Class Debate and there's still a lot of life left in the Crusade Against Skills. And of course there's my continuing drive to collect enough aluminum foil and duct tape in order to sculpt an effigy of St. Gary to worship in my basement. So, please, in future, let's keep things in perspective and remember why we're all here. Yet another awe-inspiring example of why anyone who cares about the old school renaissance should be listening carefully to Trent Foster. One of the interesting peculiarities about the Supplement I (and Holmes) thief class is that, while it possesses a "remove traps" ability, it does not possess a "find traps" ability, which wasn't introduced until the AD&D Players Handbook and also adopted by the Moldvay rules. (As an aside, it's worth noting that the Cook/Marsh Expert Rulebook lists only "remove traps" as a thief ability on its class tables, although one presumes this is just an editorial glitch). I surmise that the thief lacked an explicit "find traps" ability, since it was simply assumed they had the same chance to find them while searching as any other character class (1 in 6). Thus, thieves were adept only at overcoming traps once found but lacked any special skill in finding them. In playing my Dwimmermount campaign, what I've noticed is that what I enjoy most about traps is not the question of whether the PCs will find them -- they generally do given enough time -- but how they go about avoiding them. The players have been very ingenious in the methods they've employed to defeat many of my traps. They've really gotten into the spirit of things, describing precisely what their characters do, often employing common adventuring equipment like iron spikes, 10-foot poles, and rope to sidestep hidden dangers. When they can't do this, they look for ways around the traps, by taking other passages or doors. It's really amazingly gratifying to see and a vindication of my experiment in old school archeology. Consequently, I'm starting to think that it's not the thief's "find traps" ability that bugs me, but rather its "remove traps" ability. As I said, with only a couple of notable exceptions, the players largely intuit when traps are afoot; perhaps my dungeon designs telegraph the presence of traps too easily. Regardless, I don't find much fun in having the characters harmed through random trap damage because they failed a 1 in 6 dice roll. That's not to say I don't do it, of course. Several hirelings have died in Dwimmermount because of undetected traps, for example, but it's not something I derive any satisfaction from. On the other hand, watching the players grapple with a mysterious trap, trying to figure out what it does and how they might avoid its effects is something I do greatly enjoy, particularly when they figure out how it works only after they've accidentally sprung it. I'm not entirely sure what all this means just yet. Although Brother Candor's henchman Gaztea is a thief, complete with a "remove traps" ability, we've actually not been using that ability at all, sticking with the traditional method of having the players describe what their characters do to avoid the traps. Even after 16 sessions of this approach, we haven't tired of it and, I think, prefer it to the traditional AD&D/Moldvay method of handling trap removal with a percentile roll. Granted, it means that the vast majority of the traps I place in Dwimmermount have to be explicable, which is to say, I have to be able to describe their components and context in such a way as to enable the players to find a way to defeat them. That's limiting on some level, but it also ensures that I can't produce "traps" that are little more than game mechanics waiting to interact with the "remove traps" ability. Dwimmermount's traps have to work, if you get my meaning. So, while my stance on the thief class continues to soften, my opinion is still very much in flux and I'm finding a lot of my biggest dislike of the class, purely from a mechanical standpoint, centers around the "remove traps" ability. The first Chaosium game I ever owned was Call of Cthulhu, a game I still consider one of the most well-written and designed RPGs of all time -- a near-perfect evocation of its source material, as well as a model of continuity between editions. Call of Cthulhu was released in 1981, the same year as another remarkable game published by Chaosium, Stormbringer. Co-written by Steve Perrin of RuneQuest fame and Ken St. Andre, creator of Tunnels & Trolls, it too is a near-perfect evocation of its source material, in this case the Elric tales of Michael Moorcock. Unlike Call of Cthulhu, which I have played extensively over the last 28 years, I never managed to play a single game of Stormbringer, something I've always considered a great shame. Much as I admire RuneQuest, I have long felt ill at ease in Glorantha. Somehow it feels far too personal a creation, as if it ought to be viewed -- and only viewed -- from a safe distance rather than sullied by my feeble attempts to set adventures within it. I realize that this is an idiosyncrasy of my own; many people have, after all, managed to use Glorantha quite enjoyably over the years. Still, I can't shake the feeling that I'm just not up to the challenge of running a game set in Glorantha. The same is not true of the Young Kingdoms, which, contrariwise, strike me as exactly the kind of setting in which I'd feel right at home as a referee. The setting has a terrifically gloomy, surreal air about it, not to mention being more an outline of a setting than one whose every detail has been nailed down in voluminous detail. That "fuzziness" suits me well and I've been grateful that Moorcock isn't one of those authors who's interested in spelling everything out for his readers. Whatever his deficiencies as a writer may be, being overly fastidious when it comes to his settings is not one of them -- thus the disappointment I feel in never having had the chance to run a game in the Young Kingdoms. 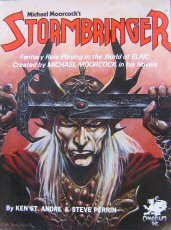 What made Stormbringer so special to me, I think, was not its rules -- though I do think that Basic Roleplaying is well suited to Moorcockian pulp fantasy, moreso than to RuneQuest in my opinion -- but the sense it conveyed, just as Call of Cthulhu did, that, though based on someone else's world, that world now belonged to you. I can't quite put my finger on how and why the game achieved this, but it did so effectively and that's why I still pine for the chance to play it after all these decades. Stormbringer is a rare RPG whose succinct, elegant rules feel complete and whose setting feels gloriously incomplete, demanding that the referee and players fill in the blank spaces with their own creations. I often don't feel that way about most licensed games and yet Chaosium has made me feel that way often. But then such magic is to be expected of the company that also produced Pendragon, another well-nigh perfect game. That a single company made not one but three games of which I think so highly is an amazing feat, one that even TSR never managed. I really do think that Chaosium is one of the great unsung heroes of the early days of the hobby and, if popularity really did have a clear relationship to quality, its games would be more widely played today. It will be noted that thieves have high chances of success in their special abilities when conditions are favorable for that action. Thieves will therefore gain new abilities requiring greater skill and danger. These will include the ability to climb overhangs, upside down, ventriloquism, powers of distraction, and the ability to mimic voices. Somehow, I never noticed that passage before or, if I did, I don't remember reading it. I'm not sure what I think about their possible inclusion or how their inclusion might have affected my estimation of the thief's place in D&D. Still, this is the first time I've seen a suggestion to expand the thief's skills in old school D&D beyond the thief-acrobat in Unearthed Arcana, but I do find it very intriguing, if only because it reveals avenues for further developing the class that are consonant with its origins rather than pushing it toward the ninja death commando of later editions. The latest session of the Dwimmermount campaign concerned greatly with logistics, as the characters spent a goodly amount of time in Adamas re-supplying and generally fortifying themselves for delving even deeper into the megadungeon. To date, the PCs have explored what amounts to roughly levels 1-3 of the ancient Thulian fortress (spread over multiple sub-levels, mind you), but their thoughts have turned lately to what OD&D helpfully calls "more and bigger loot," which means they'll soon be screwing up their courage to seek out levels 4 and below. This only makes sense, since most of the characters are about 4th level. The rewards, both from monsters and, more importantly, treasure are too small to propel them to even higher levels of experience. And while my players are content with OD&D's comparatively slow rate of advancement, they would nevertheless like to gain more experience per session than they have been netting thus far, which means facing greater dangers. While in Adamas, Brother Candor released the archer Sam from his service and hired a new higher-level archer named Cormac, while Dordagdonar acquired a new hireling named Ereth. Given the large number of horses in their adventuring party -- everyone, including the hirelings and henchmen now have mounts -- they also took on a groom named Hap. Brother Candor and Dordagdonar likewise purchased some livestock and a plow to give as wedding gifts to their former hireling Ragnar, at whose wedding the cleric promised to officiate "when he had the time." That time never seems to arrive, but I have the feeling that our next session will involve it at least in part. Brother Candor did some research into the insignia of the Thulian battle standard the party looted from Dwimmermount. He discovered that it belonged to a unit known as the Guardians of the Azure Chamber. Unfortunately, he could find little else about the unit, which appeared to an elite one with few members and was based solely in Dwimmermount, never seeing action anywhere else in the Thulian Empire. This led him to believe that the "Azure Chamber" must be located within the mountain fortress in a deeper level. Likewise, the reappearance of the word azure didn't thrill him, as it reminded him of the Termaxian cultists, the Azure Twilight. The party also paid a visit to Saidon, the cleric of Typhon. He had earlier expressed interest in purchasing any azoth-infused weapons and armor that the party acquired and did not wish to keep for themselves. Since they had an extra suit of such chain mail, they sold it to him. Saidon reiterated his interest in buying more and asked how many more they could likely acquire. When asked if by "more" he meant "a couple more or enough to outfit a regiment," he replied, "As many as you can acquire but my friends in Yethlyreom would not be disappointed if you could acquire enough to outfit a regiment." Oddly, the PCs didn't follow up on this statement, as I think they were anxious to get back to Dwimmermount. Once in the dungeon, the characters continued their explorations of the sub-level, using their map to locate passageways they'd previously neglected. This resulted in the discovery of set more rooms they'd not yet found, as well as a series of natural caves. They spent some time exploring the caves, in the process defeating a rust monster -- yep, I'm one of those referees -- and a giant slug. The slug's slimy body was covered in coins and gems, which the party then spent a goodly amount of time removing, only to realize that most of the coins were copper, at which point they stopped caring and instead allowed their hirelings to take as much as they could carry for their own purposes. All in all, a good session that opened up a number of new avenues for development later should the characters decide to follow up on them. I continue to be impressed and amazed that Dwimmermount itself holds such an attraction to my players. I've created numerous hooks for adventures outside the dungeon, but, to date, none have really been picked up. I'm perfectly fine with that, honestly, since a dungeon, even a megadungeon, is actually quite low maintenance as campaign settings go. Moreover, I'm enjoying watching their rediscovery of the dungeon setting, not to mention the reinvention of delving procedures I haven't seen used since I was a kid. The campaign continues to be much fun and very instructive in the mysteries of the Old Ways. I've read only a couple over the years that I didn't think were utter rubbish and many more that were. Consequently, I've sworn off even attempting to read such novels anymore, if only to save my slowly disintegrating sanity. That's for the best anyway, since I consider the advent of the gaming novel to be one of the signs of hobby's self-referential decadence. It's hard enough to keep pre-packaged settings free of "story" as it is without novels creating dozens of characters whose epic exploits forever change those settings, thereby feeding Ouroboros. The problem, of course, is that some gaming novels sell very well -- far better than the games on which they are based. That's why Lorraine Williams was said to have considered jettisoning D&D entirely and focusing TSR's publishing efforts entirely on the gaming novels that it spawned. For many younger gamers, gaming novels are their first introduction to fantasy literature, being for them what the works of pulp fantasy were for earlier generations of gamers. Were most gaming novels well-written, even as pure escapism, this might not bother me so much, but I fear that, with few exceptions, they don't meet even that meager criterion. 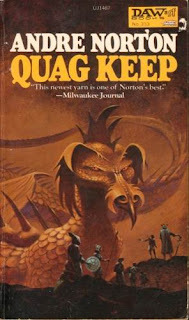 Quag Keep, a 1978 novel by Andre Norton, is a gaming novel -- the very first. Set in Gary Gygax's World of Greyhawk, it concerns a ragtag collection of six adventurers, such as the swordsman Milo Jagon, the elf Ingrge, and a lizardman named Gulth, who all find themselves compelled by means of a geas to make one another's acquaintance and embark on a quest together. This geas seems to be tied to strange bracelets they all wear, bracelets from which dangle oddly shaped polyhedral shapes and that occasionally give them flashes of their having been other people on other worlds. As the novel unfolds, the true nature of these characters becomes more clear, as does the nature of the geas and the quest they're undertaking, although I can't say that any of it should come as a surprise. Quag Keep is a very odd novel. It's far from Norton's best, even if its central premise is potentially intriguing. I would love to know more about its origin and what role Gygax and TSR had in it, since the author specifically thanks Gygax for his "invaluable aid." For me, the real interest here is in its portrayal of the World of Greyhawk, a setting that had not yet been published for gaming purposes in 1978. The setting Norton describes is recognizably Gygaxian in its nomenclature but many other elements, such as the war between Law and Chaos, seem unfamiliar. Are they based on earlier conceptions of the setting than the one published by TSR or were they wholly the invention of Norton? I wish I knew. Despite its flaws, Quag Keep is worth reading, if only as a historical document of a time before gaming novels were commonplace and a distinct genre of fantasy literature. That an established and much-esteemed science fiction and fantasy author like Norton would be the one penning it rather than a game designer-turned-novelist is even more noteworthy and reminder of the very different relationship D&D once had with genre fiction. It's rare that I get a feeling of déjà vu while reading a contemporary old school product, particularly adventures. Yet Sanctum of the Stone Giant Lord by R.C. Pinnell did just that. While reading it, I felt almost transported back to the summer of 1980 when I was subjected to the tender mercies of my friend's older brother, who ran us through the G-series of modules. It was our first experience with high-level AD&D so we were all given pregenerated characters -- I played Cloyer Bulse the Magsman, a rare example of my ever playing a thief -- and I'm not ashamed to say we had no idea what we were doing. As happened so often when my friend's brother refereed us, our forays against the giants ended rather badly, but, rather than dissuade us from ever again attempting these classic modules, they only emboldened us further. The following year, after some of my friends' characters, including Morgan Just, had legitimately reached the appropriate levels for Against the Giants -- I never owned the monochrome cover modules like my friend's brother -- I ran these modules, along the D-series sequels, and we had a blast. Many PCs met their doom in these modules, but many others survived and some of the most enduring memories I have of the early days of my gaming are associated with the Giants/Drow adventures. Strangely, one of those memories is the presence of many stone giant "visitors" in both modules G1 and G2. Though neutral in alignment according to the Monster Manual, these modules intimated that the stone giants had taken an interest in the actions of their hill and frost giant cousins and were maintaining contact so as to determine whether or not to join the Drow-instigated campaign against the local human settlements. I remember this, because Morgan Just, a renowned slayer of giants, vowed to investigate the stone giants' involvement in such villainy and to make them pay if they'd aided the other giants in any way. Morgan never did follow up on his vow -- he had bigger fish to fry, if I recall -- but I still remember wondering about the implied involvement of the stone giants in that epic collection of modules. Apparently, I wasn't the only one to wonder about this, as Sanctum of the Stone Giant Lord treats this very topic, offering up a single-level dungeon that can easily be used as an adjunct to the G-series. Designed for characters of 10th-14th level, Sanctum, like its illustrious predecessors, is tough going, with many, many tough opponents and other nasty surprises. That's because the eponymous sanctum isn't an abandoned ruin but rather a hidden religious site for the stone giant clans. Consequently, the place is crawling with giants, their allies, and servitors, which will complicate any attempt to enter it without raising an alarm. Also like its predecessors, Sanctum is a location-based adventure with a minimum of plot. The characters could intend merely to raid the stone giants' fortress to "teach them a lesson," but there's more going on here than meets the eye, with the chief shaman behaving oddly and unusual envoys whispering in his ears. Some no doubt would see this as a weakness of the module and I'll grant that even its thin plot is less well detailed than it ought to have been (only a handful of sentences even allude to what's going on in the Sanctum). Nevertheless, one of Sanctum's great strengths is its true modularity; it can easily be dropped into any campaign and used in a variety of ways, which is, to my mind anyway, the mark of the best modules. That's not to say that Sanctum of the Stone Giant Lord is perfect -- I have some qualms about the large number of magic items in its treasure hoards -- but it does very effectively evoke the look and feel of its predecessors and inspirations. Obviously, that's a pretty limited goal and not to everyone's tastes. Though the module is only 12 pages long, its text density is high, much like the G-series adventures. Indeed, the entire look of Sanctum is clearly modeled on the monochrome G modules, from the two-column layout to typographical conventions (bolding the names of magic items, for example). Artwork is sparse but extraordinarily well-done by Rachel Drummond, reminding me of no particular old school artist but nevertheless possessing all the hallmarks of the best illustrations from the early days, right down to the historically plausible armor worn by the fighters on its cover. As people know well, I'm usually very down on products that too closely mimic the look of older ones, but I'm not bothered in this particular case. Sanctum of the Stone Giant Lord is self-avowedly the result of "a laborious love affair" by author R.C. Pinnell, as well as an homage to Gary Gygax's own pioneering modules and to whom this adventure is respectfully dedicated. It's thus the best kind of nostalgia product, one that transports one to "the good ol' days" without either apology or qualification. That gives the whole thing a very primal quality that's frankly intoxicating to guys like me who remember the G-modules with fondness. Sanctum of the Stone Giant Lord is in no way the equal to any of its inspirations, but it's a fitting companion to them and a great example of how those early modules fired the imaginations of young people to such an extent that they're still involved in this hobby 30 years later. 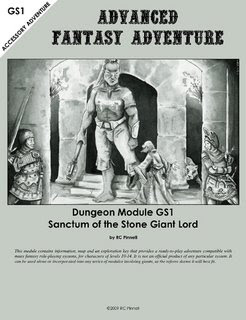 Sanctum of the Stone Giant Lord is available in both print and PDF form for $7.05 and $1.25 respectively. Buy This If: You're a fan of the G-series and are looking for a well-done companion to those classic modules. Don't Buy This If: The G-series modules do nothing for you. Feel free to call me an idiot but I have a question I can't answer: when did electrum and platinum pieces first make their appearance in D&D? They don't seem to be in the LBBs at all and I can't see any clear references to them in the supplements either. Were they introduced in AD&D? I'm nearly finished the latest revisions to my adventure The Cursed Chateau, whose earliest draft was written almost exactly a year ago. Since then, I've expanded the original adventure, commissioned new maps (by Rob Conley), and generally spruced the whole thing up. I'm fairly proud of the whole thing, but, before it's published -- sometime late this year -- I need playtesters who are willing and able to run the thing. I'm not looking for them just yet. I still have a little more tweaking of the text to complete. I expect the playtest draft will be ready sometime next month and, when it is, I'll put out a formal call for people to assist me. I can't promise anything in return except a credit in the published version and copies of the module when it's released. 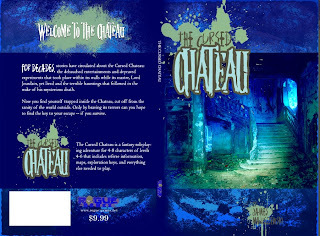 The Cursed Chateau is a self-contained module for 4-8 characters of levels 4-6. It's not written for any specific old school fantasy RPG or retro-clone, but it's broadly compatible with most of them (though it does use the traditional AC system, so devotees of alternative systems will need to do some conversion there). Playtesters can use whatever system they like, though I'd like to know what system it is, since it'll affect the weight I give to comments about how challenging the adventure is. As you can see, it's not intended as an homage to early gaming art or graphic design. Much as I love that stuff, I'd much prefer it if each publisher of the old school renaissance had its own unique "look." We catch enough flak as it is about "nostalgia" and "rose-colored glasses" as it is; in my opinion aping the past only gives further fuel to such charges, mistaken though they may be. There's a diversity of approaches and philosophies in the old school movement. Wouldn't it be nice to see that diversity better reflected in its esthetics? I wish to extend my thanks to everyone who's recently made donations, both big and small, to me through this blog. Although I happily write as much as I do without any expectation of recompense, I nevertheless very much appreciate donations. They're a good indication that my readers find value in what I'm doing. I use the money I receive in donations to purchase new old school products for review and discussion here. Given how much material is being created these days, a little bit of financial assistance is more useful than ever. Voting for the ENnie Awards starts today and continues until August 1st. Normally, this would mean very little to me, since I'm as skeptical of fan awards as I am of industry-based ones, but, dyed-in-the-wool hypocrite that I am, I'm making an exception this year. Mythmere Games's Swords & Wizardry has been nominated for "Best Free Product," one of only two products in the category that I think, in my highly biased opinion, abides by its spirit. I'd like to urge everyone who feels the same way to cast a vote for S&W by following this link. I don't expect it to win, but stranger things have happened and, by some stretch it should take the prize, that'd be a remarkable achievement, not just for Swords & Wizardry but for the entire old school movement. There's also a category "Best Publisher" and both Goblinoid Games and Mythmere Games have been nominated. Since you can vote for up to 20, if you do vote, make sure to cast votes for both these companies, who've done a great deal for the old school renaissance over the last couple of years. We owe them both a debt of thanks for what they've done thus far. Again, I don't expect either one to win, but I'd hate for that to be for lack of trying on our part. So, if you're so inclined, please go vote. I don't normally participate in the ENnies as a voter; I made an exception this year. Perhaps you should too. The most recent session of Dwimmermount saw further exploration of the current sub-level, with several combats against hobgoblins and ogres, who seem to be the primary inhabitants of the place. Like the orcs of the earlier levels, the hobgoblins employed Thulian weapons and armor, including a strange device that appeared to be an "azoth projector" -- basically, an arcane flamethrower that used ignited azoth for fuel. Unsurprisingly, Dordagdonar, who's revealed himself to have quite a fascination with human technology despite his avowed disdain for "ephemerals," decided to dismantle the device -- it was mounted onto the floor -- and take it with him when he returned to civilization, in the hopes of re-mounting it on a wheeled cart and finding a way to make it function with another fuel source. The session itself was noteworthy not so much for its actual events but for the way those events helped to give me some further insights into old school play. First, the characters lost another hireling, Drogo, and, rather than planning to replace him at the first opportunity, they didn't really see the need to do so. Indeed, Brother Candor is contemplating releasing Sam the Archer from his service, since Sam is just a 1st-level Fighting Man and is increasingly outclassed by the monsters they're encountering in Dwimmermount. The party, which once consisted of a very large number of hirelings, is slowly shrinking in size, with most of the remaining NPCs being either henchmen (like Henga the Shield-Maiden) or specialists (like Gaztea). What this suggests to me is that hirelings are most useful in the earliest levels of a character's life -- level 1-3. As they reach 4th level or thereabouts, hirelings prove less useful, as the PCs can now handle much greater dangers without having to ring themselves with cannon fodder. Hirelings are thus the old school way of augmenting low-level effectiveness, which only makes sense, since low-level characters are quite fragile. However, managing hirelings is a strategic obstacle, requiring the players not only to locate their employees but also negotiate a salary that they can then provide. Likewise, as NPCs, hirelings cannot be totally relied upon: they're subject to morale and have goals of their own beyond being used as canaries in the coal mine. I rather suspect that much of the early roleplaying in a campaign comes from interactions between the PCs and their hirelings; that was certainly the case in Dwimmermount. Over time, the players develop affection for some hirelings over others and it's these that wind up becoming henchmen. That was the case with Henga and would have been the case with Brakk, had the goblin survived the bucket of acid that fell on his head in Adamas. It's thus my experience that, far from being an impediment to roleplaying, hirelings (and henchmen) actually encourage it. The other thing I noticed was that, when Dordagdonar suggested re-tooling the azoth projector for his own use, I didn't bat an eye at the suggestion. Certainly I suggested it'd take time and money to complete -- if it were even possible -- but I didn't even consider dissuading his player from this plan. One of the things I like about this campaign is that, because there's no grand plan, rolling with the punches is a matter of course. While I'm sure my players could come up with an idea that might derail my very limited plans for the campaign, the odds of its happening are pretty small. That's frankly very liberating for me, much in the way that not having a large and detailed map of the world is liberating: I can easily add new things as I need them. At present, the only civilized places the characters have been are Muntburg and Adamas. They know about Yethlyreom, the city of the necromancers, but they've never shown any inclination to go there, which is why it hasn't yet been placed on the map. That gives me the freedom to make it near or far as required. The same goes for any other future settlements or locales I might decide to include in the campaign. This approach has really cut down on my prep time for the game sessions -- to nearly none at all -- but it does demand a fair bit of mental agility on my part, but then that's part of the fun of it for me. Having to make things up on the fly is one of the joys of being the referee; it's also why having lots of random tables was a hallmark of old school play. Game time is of the utmost importance. Failure to keep careful track of time expenditure by player characters will result in many anomalies in the game. The stricture of time is what makes recovery of hit points meaningful. Likewise, the time spent adventuring in wilderness areas removed concerned characters from their bases of operation – be they rented chambers or battlemented strongholds. Certainly the most important time stricture pertains to the manufacture of magic items, for during the period of such activity no adventuring can be done. Time is also considered in gaining levels and learning new languages and more. All of these demands upon game time will force choices upon player characters, and likewise number their days of game life. One of the things stressed in the original game of D&D was the importance of recording game time with respect to each and every player character in the campaign. In AD&D it is emphasized even more: YOU CAN NOT HAVE A MEANINGFUL CAMPAIGN IF STRICT TIME RECORDS ARE NOT KEPT. Thus spake Gygax in the AD&D Dungeon Masters Guide. As he often did, Gary was undoubtedly engaging in a bit of hyperbole in order to emphasize a point, but that point is well-taken all the same. I quote the above paragraphs because I was reminded of them while re-reading The Underworld & Wilderness Adventures volume of OD&D, which does include, as Gygax states, a section on recording the passage of time. Those four lines are very intriguing, both for what they say about OD&D play as it was conceived by its authors and for what they say about OD&D as it was actually played back in the day. Let me begin by stating that I keep track of time in my Dwimmermount campaign. Since the game began 291 days have passed. That number is based on the notion that each week of actual time represents a week of game time, with some additional days added based on in-game journeys -- the three days back and forth between Adamas and Dwimmermount, for example -- the manufacture of scrolls by Dordagdonar, and other similar time sinks. I settled on the "1 actual week = 1 game week" out of convenience, as I hadn't remembered the OD&D guideline, but I'm pleased my instincts on the matter were sound. What seems immediately apparent to me is that OD&D's understanding of a "campaign" is still strongly informed by a wargames mentality, which only makes sense historically. Nevertheless, it's interesting that OD&D presumes that "as the campaign goes into full swing it is probable that there will be various groups going every which way and all at different time periods." This presumes multiple adventuring parties within the same campaign, which, again, only makes sense when you consider the 20-player standard of OD&D. What's most striking to me, though, is that all this emphasis on time-keeping and how long every thing takes paints a picture that is strategic in its focus rather than tactical. I've mentioned before that dungeoneering is more like mounting an exploratory expedition into terra incognita than it is to simple treasure seeking. The fact that OD&D often uses "expedition" as a synonym for a dungeon adventure only encourages such an interpretation more strongly in my mind. Old school D&D would thus seem to be a game focused on long-term projects and goals. Or at least long-term projects and goals form an important part of its foundation, acting to ground individual game sessions in a larger context. That's why I think "story" is an emergent property of an old school campaign rather than its actual focus. In any case, I'm still pondering the meaning and ramifications of OD&D's time-keeping conventions. Even though I'm abiding by something close to them in my own OD&D campaign, I can't yet say they've had any specific impact on play, but that may be because we've only been playing for a (comparatively) short time and that, like "story," the significance of it all can only be seen well after the fact. The eternal war between Law and Chaos flared often in Greyhawk. It was in a manner of speaking a "free city"--since it had no one overlord to hold if firmly to his will. For that reason it had become a city of masterless men, a point from which many expeditions, privately conceived and planned for the despoiling of ancient treasures, would set out, having recruited the members from just such masterless men as Milo himself, or perhaps the berserker only an arm's length away. Reading through Volume III of OD&D, I was treated to several intriguing bits I either didn't remember or somehow overlooked in previous readings of the game. "Most doors automatically close," the text notes, which I presume was intended to delay the retreat of the player characters in combat situations or to make them use iron spikes to hold them open (which themselves have a one-third chance of slipping). On the other hand, "Doors will automatically open for monsters," which made me think of Jeff's goblin doors. Characters who are surprised have a 25% chance of dropping an item he is holding. Given my new-found respect for percentile dice, I may just use this rule straight, but there's a part of me that wants to make each player whose character is surprised to roll 1D20 with any result of 1-5 meaning that the character has dropped a random item he's holding. Jay MacBride has pointed me toward an amazing online database from the UK that includes the detailed service records of over 250,000 soldiers who fought between the years 1369 and 1453. Anyone with an interest in medieval history, especially military history, will find this database a veritable treasure trove of information. I'm frankly more amazed that this many records survive than I am that they're freely available online. There's no question that this is a remarkable resource. Thanks again, Jay. 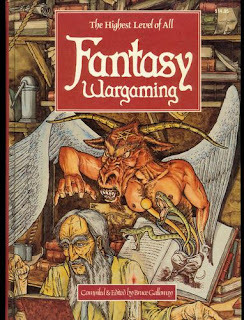 If I had to nominate a single product for the category of "weirdest RPG I've ever owned," there's a good chance it'd be the 1982 book Fantasy Wargaming, edited by Bruce Galloway and written by a number of (presumably British) authors I've never heard of. I bought my copy back when chain book stores still sold gaming products in large quantities, by which I mean that they not only stocked many copies of most products but also sold products by companies other than TSR. I can only presume that gaming was still enough of a fad in 1982 that someone thought it'd be a good idea to offer this bizarre book for sale. Of course, I bought a copy, so I guess they were correct! Another reason I deem this volume bizarre is the disdain it exhibits not just toward existing RPGs -- that's a fine old school tradition -- but toward roleplaying generally. The authors I surmise based on comments here and there were Napoleonic wargamers at Cambridge who one day decided to give "fantasy wargaming" a whirl to see what all the fuss was about. Though they enjoyed roleplaying as "pure escapism," they nevertheless found it lacking and this book is the result of their attempt to correct the deficiencies they saw in it. Most of those deficiencies were in the realm of "realism," something that powerfully dates this book as a product of the late Golden Age, when dueling articles on the physics of falling damage were regular contents of Dragon. Of course, the authors of Fantasy Wargaming were much more interested in social/historical realism, which is why the book is filled with broadsides against most fantasy, both literary and gaming, which fails to take into account this or that little bit of trivia about the European Middle Ages. The end result of this is a game -- assuming it is even playable, which is far from certain -- whose nitpickiness about historical minutiae puts Chivalry & Sorcery to shame. Unlike C&S, though, there's not a lot in Fantasy Wargaming that can be profitably mined for other games. There are some interesting bits about historical arms and armor and social structures, but all of that could be found in better written and detailed scholarly books. Beyond that, perhaps the most entertaining section is the ranking and stats for the hierarchy of Hell, with a corresponding ranking of the powers of Heaven -- just in case you ever wanted to know the combat abilities of the Blessed Virgin Mary or St. Francis of Assisi. Most rules are written both suggestively and opaquely. That is, they imply much but say very little. That's probably why, as a youth, I remained convinced that Fantasy Wargaming was a playable game, even though I never actually inflicted it on my friends, as I did DragonQuest. So why did I ever buy this book? It's hard to remember this, but, even in 1982, roleplaying was big. It was a huge, huge fad and, while the total volume of product was probably much smaller than what is released today, there was still enough of it, available through a wider variety of outlets than nowadays, that I was offered many opportunities to dabble and see what the hobby was like outside the TSR/D&D orbit. Sometimes, this brough into contact with gems like Call of Cthulhu, but, more often than not, it gave me stuff like Fantasy Wargaming. At the time, I was looking to shake up my D&D campaigns and inject a bit more "realism" into them. I quickly realized that, even if that goal were itself a worthy one, Fantasy Wargaming wasn't going to help me achieve it. The funny thing is that I still own a copy of this book. For all its oddities -- or perhaps because of them -- I pull it off my shelf every now and again and read through it, if only to remind myself that, while its focus may have shifted over the years, the craziness of gamers has remained a glorious constant of the hobby for as long as I've been involved in it. May that never change. John Adams has announced that Brave Halfling Publishing will once again be supporting Labyrinth Lord. I think this is terrific news. BHP's Labyrinth Lord products are among some of my favorite recent old school releases. I am hopeful we'll see many more excellent products for LL coming our way in the future. As the Dwimmermount campaign has evolved -- I have another session report to post sometime this week -- the gravitational pull of the little brown books plus supplements has become inexorable. There are lots of reasons for this, chief among them being my growing (and possibly Quixotic) quest for D&D 0.75. Much as I rail against many aspects of AD&D, I can't deny that the flavor of those rules very much appeal to me. But I could never run a full-on AD&D game again. I'm no longer mentally nimble enough to do so effectively and I am now so enamored of the OD&D ethos that AD&D, flavorful though it is, feels too much like a straitjacket to me. So I've reading and re-reading all my OD&D books and it's been an interesting experience. It's hard now to find them nearly as impenetrable as I once did, because I've been so immersed in the extensive exegesis of their contents for the last two years that they seem (almost) straightforward to me. I realize they're not in any absolute sense, but I also more keenly understand that, if one had been part of the wargames culture out of which OD&D sprang, they probably weren't quite as opaque as they seem decades after the fact. That's not to say that no one had trouble understanding them, because we know they did, but I suspect the number of early adopters who were baffled by them is smaller than is suggested in after-the-fact discussions by people with a vested interest in claiming OD&D is the gaming equivalent of the Voynich Manuscript. On the other hand, I'm not convinced that OD&D, especially the LBBs, contain hidden depths of meaning that can only be plumbed after extensive periods of prayer and fasting. Rather, there are many passages and even whole sections whose meaning is obscure because of either the way they were written -- no one can claim OD&D is a model of auctorial clarity -- or a dependence on a context not provided by the text itself. That's why it's so vital to speak to people who were involved in the hobby at the time in order to gain that context. It's been my contention from the start of this blog that a lot of this knowledge is in danger of being lost forever, which would be a pity. Wisdom is the only stat that does nothing other than provide an XP boost. Even Greyhawk does not expand upon Wisdom's mechanical utility. This strikes me as very odd. Originally, only fighting men benefited from high Dexterity in terms of being harder to hit. I must say I rather like this approach. All magical armor is plate mail. As I continue my readings, I'll post other observations here. I can certainly see why some might claim OD&D has hidden depths, since those little books repay regular re-readings, if only to find passages that one might have overlooked before. Swords & Wizardry has been nominated for an ENnie award in the category of "Best Free Product." Looking over the list of other products in the category, I notice that three of the five nominees seem to be "quick starts" -- essentially advertisements for other products rather complete games in themselves. Now, EN World can do whatever they want when it comes to the ENnies; these are their awards, after all. Still, I find something a bit silly and, dare I say, inappropriate in having a game like S&W, whose free version is every bit as complete as its retail version, competing against stuff like the Hunter: The Vigil quickstart, which is nothing more than an adventure with pregenerated characters and a stripped down version of the full rules you need to pay for to get. On the bright side, it's fairly impressive to see an old school product appear on the nominations list at all. That's a definite victory for the old school movement and I hope it's the first of many more to come. The Fandom Association of Central Texas has established the Aaron Allston Donation Fund to help defer the costs of Mr Allston's recent bypass surgery. Although most well-known as a novelist, Aaron Allston began his writing career in the RPG business in the mid-80s, his most noteworthy product being the Dungeons & Dragons Rules Cyclopedia about which I wrote recently. Information on how to make a donation to the fund can be found via the link above. Jack Vance's sequel to 1966's The Eyes of the Overworld was published in 1983 -- too late for Gary Gygax to have included it in Appendix N. Nevertheless, there's little doubt that Cugel's Saga, like its predecessors, is a "D&D novel," which is to say, a novel whose characters and plot, such as it is, reflect the rambling picaresque nature I strongly associate with the campaigns of my youth. 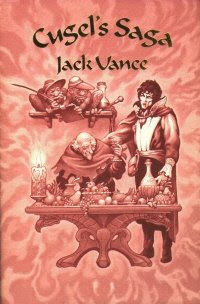 Granted, Vance's characterizations, to say nothing of his dialog, far exceed anything I ever created in those bygone days, but the fact remains that, of all the Dying Earth books, this is the one that reminds me most of the perpetually down on their luck ne'er-do-wells that populated games of yore, not just in my own campaigns but in those of my friends. Cugel's Saga has a vaguely Sisyphean quality to it, as the title character begins the novel trying once again to make his way home to Almery after having been outwitted by Iucounu the Laughing Magician -- exactly the same predicament in which found himself in The Eyes of the Overworld. This time, though, Cugel seems even more determined to exact his revenge upon Iucounu, along the way acquiring both items and accomplices that he hopes will enable him to achieve his ultimate goal. Consequently, this novel feels somewhat different than its predecessor, even though the overall plot -- more like a collection of vignettes really -- is roughly identical. To my mind, Cugel's Saga feels somewhat dark, though not nearly as dark as The Dying Earth. Part of that may be because his failures do not sit well with Cugel, making him ever more intent on giving Iucouno his comeuppance. Consequently, Cugel comes across, to me anyway, as a bit more despicable and self-interested than he was in The Eyes of the Overworld -- a fairly impressive feat. He's still amusingly foppish, vain, and convinced of his own natural superiority, but there's a single-mindedness to him now that casts some of his actions in deeper shadow. That's not to say the novel is not humorous, since it is, uproariously so in places. Rather, I wish to point out that, just as The Eyes of the Overworld has a different literary "texture" than does The Dying Earth, despite being set in the same world, so too does Cugel's Saga feel different than The Eyes of the Overworld, despite focusing on the same character. Nevertheless, Cugel's Saga offers nearly everything you'd expect from Jack Vance at the height of his powers. If the book has a weakness, it's the ending, but then one doesn't read picaresques like this one for the ending; it's the journey along the way that's the true story. Thanks to everyone who pointed me toward this article about Jack Vance from the New York Times. The article includes both an assessment of his work by other authors and critics and an interview with Vance himself, all of which is quite fascinating, especially if you're a fan of his work, as I am. Once I finish up my current reading, I think I'll be re-reading all of his tales of The Dying Earth, since it's been a while since I did so. Who's Afraid of Percentile Dice? I rather expected my recent post on morale to raise some eyebrows because it's percentile-based rather than based on, say, 1D20 or 2D6. I have in the past expressed some unhappiness with percentiles in OD&D and many of my most recent house rules and other designs have purposefully avoided using them. I did this in an attempt to keep things "simple," on the assumption that using not just two dice but two new-fangled dice would somehow ruin my experiment in playing OD&D as the Ancients played it. I've discovered, though, that, much as I discovered through my use of only D6 and D20 -- another part of my experiment -- I miss the use of all the polyhedrals. Again, I expect this may raise some eyebrows, but it shouldn't. The Dwimmermount campaign has from the start been partly an exercise in "ludographic archeology," which is to say, an attempt to understand early gaming by sticking as closely to its conventions as I could, right down to the types of dice I used. It's been absolutely wonderful in that regard, helping me to understand quite a number of things that I would not have if I'd just approached OD&D purely on a theoretical level. That's why I've always advocated that more people actually sit down and play these games we're all talking about. It's only through play that certain things truly become clear and clear in ways that are utterly impossible to predict. A case in point is dice. 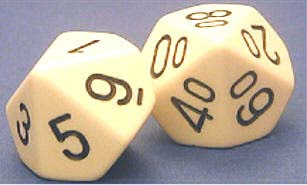 Rolling dice is fun and rolling lots of different kinds of dice is even more fun. In the case of weapon damage, for example, I discovered that weapon choice seems more meaningful when different dice types are attached to different weapons. This is a small thing and, mechanically, it is. The difference between rolling 1D4 for a dart and rolling 2D6 take the lowest (as I had been doing for small and/or improvised weapons) isn't all that great, but it feels different and in ways that contribute greatly to player enjoyment of the game, at least at my table. The same goes for a myriad of little rules, sub-systems, and practices, changing any one of which, if I were to present it outside the context of play, might seem insignificant but that, in play, had an impact. A good example of this is the saving throw mechanic, something that I think feels better in its original form than in any of its revised versions. That's the biggest insight that my months-long Dwimmermount campaign has given me thus far: what rules "work" and which ones don't often have very little to do with how "simple" or "efficient" or "intuitive" they are and everything to do with what they inspire and encourage in the players who use them. My Dwimmermount campaign's rules have evolved over the course of the fourteen sessions we've got under our belts. It's no longer a "pure" version of any rules set, but its "impurities" are the result of actual play, not out-of-game theorizing about what rules are "clearly better," to borrow a phrase. Many of the supposed flaws in OD&D -- or indeed most old school games -- are only flaws if you're looking at them in an overly intellectualized fashion divorced from actual and regular play. That's why many things I'd originally thought just didn't "work" or were "impurities" have slowly crept back into my campaign and other things I saw as improvements are being jettisoned. I think I now have a better sense of how and why many things changed in OD&D from the initial release in 1974 until the publication of its last supplement two years later. I'm seeing many of the same changes in my own game and, rather than resist them, I'm embracing them. That's another thing I've learned: sometimes the game takes on a life of its own -- and that's a good thing. Indeed, that's what we all ought to be striving for. And when that happens, when a campaign takes off to such an extent that it pulls you along with it, that's no time to be thinking in the abstract about whether something works or not. That's when you just pick up the dice -- even percentile ones -- and roll. 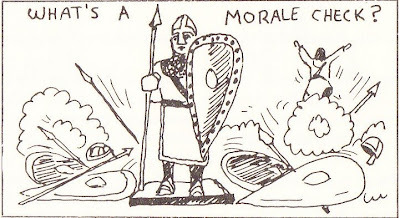 Morale is one of those aspects of D&D combat whose absence, I think, adversely affects its feel. The Holmes rules with which I began playing did not have any morale rules that I recall, but my friend's older brother, who initiated us into the hobby, used a simple percentile morale system based on the hit dice of the monster, with a few situational modifiers. My friends and I adopted that system for ourselves and, once the Moldvay rules were released, we swiped some ideas from it to use to our by-then familiar system. And that pretty well covers it beyond some occasional extemporaneous modifiers. Goblinoid Games is having a summer sales event. There are a limited number of softcover Labyrinth Lord rulebooks available for $17.95 + free shipping to anywhere in the United States. These softcover books are not Lulu copies but high-quality paperbacks with laminated covers. Check out the Goblinoid Games website for more information. Side by side with what I generally call "pulp fantasy," there existed another type of fantasy -- the "weird tale." Weird tales both blend and transcend fantasy and horror, expressing, in the famous words of H.P. Lovecraft, "A certain atmosphere of breathless and unexplainable dread of outer, unknown forces ..." There's no doubt in my mind that weird tales inspired many of the hobby's earliest designers and players, since we know that these stories and their authors -- Arthur Machen, Algernon Blackwood, William Hope Hodgson, and many others -- were read and enjoyed by them. Nevertheless, it's difficult to point to any single element or concept from D&D and say "This is from E.R. Eddison" or "That is from Walter de la Mare." Partly that's because what makes the best weird tales so memorable is hard to extract and replicate in a roleplaying setting. While "the weird" is not literally ineffable, it does defy easy categorization. You can't just put it in a box and pull it out whenever you have need for it. "Weirdness" is a fleeting, emergent property whose ethereal existence depends largely on context and context takes effort to provide, which may explain why so few roleplaying game products have ever really managed to emulate the weird tale effectively. Consequently, when James Raggi refers to the weird tale in his introduction to his Death Frost Doom, going so far as to thank many of the authors cited above -- "for inspir[ing] me to think in dark colors and minor chords" -- I can't deny that I was very intrigued. Even if he failed in emulating the weird tale, I had to admire the man's chutzpah for trying something comparatively few adventure writers ever have. What's truly remarkable is that he didn't fail, or at least he didn't fail in producing an adventure that genuinely conjures up that atmosphere of breathless and unexplainable dread of which Lovecraft spoke. Death Frost Doom is a 28-page booklet, with an outer cover that includes the map for an evil shrine where the bulk of the adventure's action takes place. The booklet is roughly the same size as OD&D's little brown books, but the text density is much higher, thanks to a clean, easy-to-read two-column format. The maps are simple and serviceable -- nothing noteworthy but then I don't think they're supposed to be. The artwork, by Laura Jalo and Aino Purhonen, however, is uniformly excellent, possessing a fevered dream quality that complements the text perfectly. Indeed, I'd go so far as to say that the text would not have been quite as effective had it not been for the accompanying illustrations. Death Frost Doom consists of two parts, the first being the largest and most elaborate. The adventure is not explicitly written for any particular level of character; Raggi notes that he has always run it for levels 3 and below, but opines that it would work well for characters up to 6th level. That rather broad range of levels should give you some indication of the looseness of the adventure's design, whose challenges are not primarily about armor class and hit dice but psychological and moral resolve as the characters investigate a graveyard, cabin, and shrine, all of which share terrible secrets. Death Frost Doom's first part is thus a location-based scenario, with the "plot" arising out the characters' interactions with what they encounter rather than anything more pre-planned. Indeed, with the exception of a single NPC at the start -- the genuinely unnerving Zeke Duncaster -- the adventure is largely directionless and open-ended, allowing referees and, more importantly, players to make of it what they will. I find it very hard to describe either the specific contents of the adventure or the feelings they engendered in me. 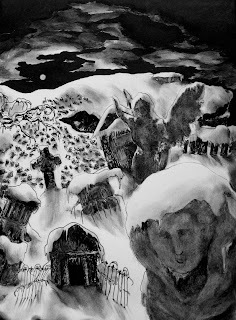 I can only say that, simply on reading the text and looking at the illustrations, I was mildly unsettled, much as I might be after reading some of the better weird tales Death Frost Doom seeks to emulate. That's not the same thing as saying I was frightened, let alone shaken to my core, because I wasn't. Rather, I felt peculiar emotions that I can't quite name -- a kind of déjà vu, as if I'd read this adventure before even as I was certain I had not. I don't wish to be repetitive, but "dream-like" is the best way to describe my feelings and that's probably as good evidence as I can offer that Raggi has written something pretty amazing here, although I can easily imagine many not finding it nearly as unsettling as I did -- but then that's the nature of the weird tale in my experience. The second part of Death Frost Doom is more or less a sketch of a location, lacking even a map. Called "The Tower," it's a revised version of something that first appeared in Fight On! #4 and I'm honestly at a loss to say how it differs form the original beyond the lack of an NPC to get the player characters interested in exploring the eponymous tower. Like the first part, the second is very atmospheric and unsettling. In some ways, I actually think it's the better of the two, simply because of its comparative brevity. There's less explanation of the hows and whys of its creepiness and that opens up the dark recesses of my imagination far more readily. At the same time, "The Tower" is much less "ready-to-run" than the first part of Death Frost Doom. It's more of an outline of an idea, even if it's a wonderfully dreadful outline. Death Frost Doom is, quite simply, an inspiring product, managing to combine an old school agnosticism toward "story" with the kind of atmosphere and ambience one tends to associate with newer understandings of roleplaying. That the whole thing is so well grounded in the literary forebears of the hobby only impresses me more. Only the recent People of the Pit comes even close to being as perfectly evocative of its subject matter and it falls short of what James Raggi has achieved here. Death Frost Doom is almost certainly an acquired taste and I imagine even some gamers who appreciate the weird tale may find it difficult to use with every group of players. That doesn't lessen its virtues, though. If anything, it only highlights how difficult it is to create a cookie cutter, paint-by-numbers adventuring experience that's guaranteed to work for all groups. I'd much rather see writers risk producing adventures that succeed brilliantly for only a small sub-set of players than cranking out modules that provide the same bland experience for everyone. Here's hoping Death Frost Doom is the first of many adventures that dare to be different. Buy This If: You love weird tales and/or are looking for adventures that are inspired by them. Don't Buy This If: You don't like weird tales or prefer your adventures to be much more straightforward and/or "heroic" in nature. Writing reviews to "sequels" is always difficult for me, especially if the follow-up product shares a lot in common with its predecessor. On the one hand, I could just point readers to my review of the original Points of Light and say, "It's just like this but with new settings." On the other, I could cover a lot of the same ground and use examples from the new product to make the same points as I did in the original. The second approach is particularly tempting in this case, because Points of Light II by Robert Conley and Dwayne Gillingham shares most of Points of Light's virtues without introducing (many) vices of its own. Before elaborating on that point, let's get down to the nitty-gritty. 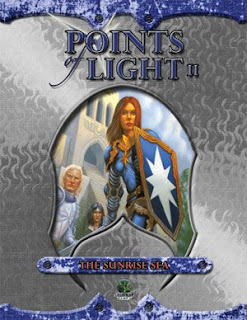 Points of Light II is longer than the original, being 64 pages in length rather than 48 (with a corresponding increase in price to $15.99 from $12.99). Otherwise, the book is physically remarkably similar to its predecessor, including the artwork and the attractively minimalist cartography. The main difference I noted was the presence of what seemed like more mini-maps for settlements than was included in Points of Light, but it's possible I'm mistaken on this point. Regardless, if you liked the look and layout of the original, you will find nothing to complain about in this product. As in the first book, Points of Light II offers four sandbox setting for use with any fantasy roleplaying game, although, again, it's clear that Dungeons & Dragons players are its target audience. Interestingly, Points of Light II, while still very stat-light, employs some D&D IV-specific terminology in describing monsters ("brute," "elite skirmisher," etc.) that I found both jarring and unncessary. Similarly, the overall power level of the new settings seems higher than that in the original, with a number of encounters being being at levels 20 or more -- another concession, I think, the advancement scheme of the new edition of D&D that was wholly absent in the initial release. Points of Light II's four settings are all very well done, as you'd expect from its authors. If anything, they're all much more imaginative than those of its predecessor. The Golden Shores: This is a kind of fantasy "age of colonization" setting, complete with valuable resources to exploit, a restive aboriginal population, and shadowy enemies. It's by far my favorite of the four settings. Amacui: If "the Golden Shores" is a fantasy version of the colonization of North America, then Amacui is more like the conquest of South (or Central) America, complete with Aztec analogs, albeit ones in a much better position to defend themselves against outsiders. The Misty Isles: This setting is an archipelago consisting of many islands that vary in terms of their inhabitants and challenges -- think The Isle of Dread spread over many islands. Mazatl: This is the oddest of the four settings in my opinion: the volcano home of an evil god. It's a very portable setting, I think, but one that struck me as being much more limited in scope compared to the other three. Mazatl is really more of a locale than a setting, if that distinction makes sense. As you can see, Points of Light II focuses more on exotic, far-off settings than did its predecessor. That's both its biggest selling point and its greatest potential pitfall. I think this product is more likely to appeal to experienced gamers looking for a change of pace than it is to new gamers or those new to the idea of sandbox play. That's a very small criticism, since there's a lot in these settings that can easily be transplanted elsewhere without much difficulty. Likewise, it's no crime to cater to experienced gamers, who are often just as in need of new ideas as their neophyte brethren. Each setting in Points of Light II is longer and includes more keyed areas than its predecessor. Again, this needn't be a vice, since the descriptive text remains every bit as laconic and suggestive as in Points of Light. The mythology and background of the first book is carried over to this one, but it's generally thin enough that it can be easily discarded. Plus, each setting includes adaptation notes that point out how one might make changes to a setting so as to maintain its feel seamlessly. The notes are brief but then, as I noted, the settings are broad enough in conception that adaptation shouldn't take much effort in any case. Points of Light II is thus a very good product. It's a little less "primal" than its predecessor, which focused on more iconic fantasy RPG campaign settings, but I have no doubt many will find this a selling point. There's a lot to like here and I hope we'll be seeing more work by Conley and Gilllingham in the future -- perhaps some smaller scale adventuring locales? Buy This If: You're looking for some exotic settings for your next sandbox campaign. Don't Buy This If: You have no interest in sandbox gaming or your settings tend toward familiar fantasy tropes. First: the point of my question was not my personal preference for the traditional AC system -- which is a preference, albeit one I can explain rationally, as others have done. You'll note I didn't say, as Tweet did, that my preference is "clearly better," only that I believe it makes more sense for old school D&D, where there is no unified mechanic and where "lower is better" is not an anomalous concept restricted only to armor class. My only point was that, generally speaking, when I champion my preferences, I get hit with the much-dreaded "fundamentalist" label, whereas when Tweet does even more than that, he's speaking truth. That's what bugs me, not that someone dared to say they prefer something I do not. Second: for a topic that's supposedly so inconsequential, it sure does generate a lot of commentary. I'm not the least bit surprised, but then I think the choice of armor class system is more than just a question of mathematical pedagogy or even adherence to or dissent from tradition. Go figure. I'd meant to make note of this several days ago, but it slipped my mind -- a hazard of old age, I guess. A week ago, John Adams announced that Brave Halfling Publishing would be scaling back its operations and focusing solely on creating products for Castles & Crusades and Eldritch RPG. I'm sorry to hear this, because BHP produced some of the best products to come out of the old school renaissance. Its support products for Labyrinth Lord were particularly good and were among the few I consistently looked forward to seeing released. I think I probably own their entire catalog of products and, with only a couple of exceptions, I bought every one of them myself rather being given them as review copies -- a high compliment indeed, given my penuriousness when it comes to buying gaming products these days. In the end, though, I can't be upset if John Adams is happy with his decision and will better enjoy his business. In the short time BHP supported the old school movement, it did amazingly good work, far more than I've done in the same span. John deserves a huge debt of thanks for all that he did and I sincerely hope some joy will come back into running his business. Goodness knows he's earned it. If saying that I think the traditional "descending" armor class system makes more sense, both mechanically and philosophically, for old school D&D makes me a "fundamentalist," can I use the same epithet to describe Jonathan Tweet when he claims that "ascending" armor class is "just clearly better" without any qualifications whatsoever? I ask because it's commonplace to claim that those of us who prefer the Old Ways are somehow deluded by nostalgia or fetishizing the past or just plain wrong, but to dare to suggest that guys like Tweet, who, if the aforementioned post is any indication, either doesn't know or doesn't care about either the history of the hobby or the motivations behind the old school renaissance, are themselves mistaken in some way is seen as yet more evidence that it's 1925 and the grognards are the gaming equivalents of William Jennings Bryan. Call me crazy but somehow this seems a mite disproportionate. James Mishler has a truly terrific post over at his blog entitled "The Doom of RPG: The Rambling," in which he discusses the whys and wherefores of RPG sales then and now. It's well worth reading if you have the time and it might shed some light on just why the RPG industry is where it is today. When it comes to fantasy, I have pretty much always been a D&D gamer. 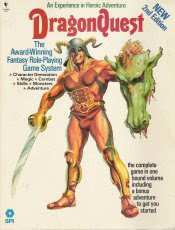 I dabbled in RuneQuest and Swordbearer at various times, but I never really got into any other fantasy RPGs, because I was generally happy with Dungeons & Dragons. That'll probably strike a lot of people as odd, even improbable, especially given the culture of wild invention that so permeated the hobby and the industry back in the late 70s and early 80s. Odd and improbable it may be, but it has the advantage of being true. I have abandoned D&D many times throughout my gaming history, of course; I think most gamers do. In my case, though, I abandoned it only when I abandoned fantasy roleplaying altogether and moved on to science fiction or horror. I never did so out of disgust or frustration with the game. Each time, though, when the fantasy bug bit me again, I returned to D&D -- except once. The one time I didn't was during my brief but passionate love affair with SPI's DragonQuest, the first edition of which was released in 1980. I never saw the first edition and I'd have never seen the second if my local library hadn't had a copy in the fall of 1982. RPGs were so popular in those days that even public libraries had copies of them, including less popular ones like DragonQuest. Intrigued, I checked it out and fell in love with the thing, eventually buying a copy, along with SPI's science fiction RPG, Universe, from a toy store in a nearby shopping mall -- again, how different the world was back then that you could easily buy third tier RPGs from toy stores! I'm still not sure what it was that first attracted me to DragonQuest, but I suspect it was because I didn't perceive in it any sense that it was the designers' attempt to "fix" D&D or do D&D "better," qualities I always perceived, rightly or wrongly, in most other fantasy RPGs at the time. Indeed, DragonQuest struck me as being off in its own little universe, almost oblivious to the rest of the gaming world. Consequently, the game held a strange fascination for me and read and re-read it numerous times. Even now, I can still see its illustrations and page layout in my memory. DragonQuest used percentile dice for all its mechanics. Character creation was a mix of random generation and player choice, since the game lacked classes and used skills instead. Races were mostly standard fantasy one -- human, dwarf, elf, halfling, etc. -- with orcs and lycanthropes for variety. Characters could begin play under the influence of certain stars or planets, granting special bonuses or penalties, an idea I'd previously seen in Chivalry & Sorcery. Combat was astoundingly complex and pretty much demanded the use of miniatures, since it used a hex grid and facing was very important. At the time, this didn't bother me in the slightest, but I doubt I could stomach it now. Characters had two "hit point" pools, fatigue and endurance, with fatigue regained quickly and easily and endurance damage being more difficult to heal. Magic was divided into several colleges. I recall that the college of summoning included lists of demonic dukes cribbed from Johann Weyer's Pseudomonarchia Daemonum, which I found endlessly fascinating. In the months following my discovery of DragonQuest, we played it a lot, but, much like Boot Hill, I can't recall now any of the characters or the adventures we had. That's not terribly surprising, since, in play, I found the game system much less enjoyable in play than it was in reading. Back then, we had a higher tolerance for such things and soldiered on, managing to enjoy ourselves despite the game's clunkiness. I know I wouldn't have the patience for that nowadays, but I still look back fondly on DragonQuest nonetheless, since it was one of a handful of RPGs that made me reconsider, even if only briefly, my lifelong devotion to Dungeons & Dragons. The game's also a reminder of the sad, sorry fate of SPI, a game company whose passing is another important marker for the passing of the Golden Age of the hobby. An integral part of my pathetic attempt to reclaim my lost youth is re-watching a lot of the old TV shows and movies that I loved as a younger person. I do this to see if my memories of them are faulty, for good or for ill. What's interesting is that there's no clear trend: some things I liked way back when simply don't hold up over time, while others are in fact every bit as good as I remembered -- or better. Star Trek clearly falls into the latter camp. I've been systematically working my way through the series from Season 1 on, thanks to the DVDs' finally being priced reasonably. I'm nearly done Season 2 now and my overwhelming feeling is that Star Trek truly was awesome. I could go on at great length about its virtues but I'll save that for some other time. What I wanted to talk about today was the format and content of the series, because I think it has some relevance for discussions we often have here. What people forget, over forty years later, is that Star Trek was, for all intents and purposes, an anthology series. There were continuing characters certainly and there was an extremely vague persistent setting, but, by and large, each episode is self-contained and makes few, if any, references to what came before. Consequently, you can watch the series in pretty much any order and it still makes sense. There's no "canon" to internalize or setting details to understand beyond the most basic ones that you can pick up within five minutes of watching any given episode. This is the exact opposite of its brandified offspring series, all of which depend, to varying degrees, on your already being invested in "Star Trek," a vast mythology constructed by mining the original 79 episodes for names and ideas that others can then elaborately build upon. 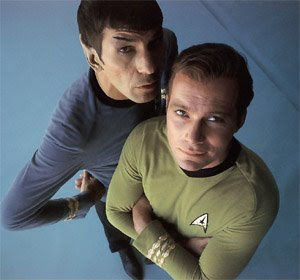 Watching Star Trek, I am continually struck by the fact that it's never about itself. Each episode is simply a science fiction adventure story, with little or no connection to anything that comes before or after. These stories are not exercises in IP mining or brand building or any of the other practices we nowadays associate with popular entertainment. I find this frankly refreshing and indeed inspiring. Perhaps this is why so many episodes of Star Trek were written by or based upon the work of genuine science fiction writers rather than professional screenwriters -- Robert Bloch, Frederic Brown, Harlan Ellison, Norman Spinrad, Theodore Sturgeon, to name a few. It's a really remarkable thing and it probably explains why, despite having been a Star Trek fan for most of my life, I can go back and find the original series far less dated than I'd expected it to be. I hesitate to use the word "timeless" to describe these episodes -- though a few of them merit it -- but the fact that the show isn't self-referential and self-absorbed does make it far more enjoyable to me than does re-watching The Next Generation, which I loved at the time of its first broadcast. There's a simplicity and directness to Star Trek that seems utterly missing from so much genre work these days, where dreams of establishing a profitable franchise overwhelm the primal desire to tell good stories. Re-watching Star Trek has reminded me that this wasn't always the case and I'm very glad of that.